solutions. Being a low-cost and readily available material, paper is suited to the production of emergency shelters for victims of natural and man-made disasters, as well as homeless persons. Paper is a universally found, easily available material of natural origin. It is cheap in production, eco-friendly and easy to recycle and re-use. Paper has been part of European culture since the twelfth century, when it arrived from the Arab countries through the Iberian Peninsula. Since then it has become a common material, occurring in many different variants and forms: books, greaseproof paper, wallpaper, posters, playing cards, etc. Despite the fact that this ‘evolved wood’, as Shigeru Ban calls it, is so widely used in other spheres of life, we relatively rarely come across it in the building industry. Paper and cardboard are hardly ever regarded as an independent material or primary construction material. Actually realised examples of architecture using paper as a main construction material have proved that it is suitable for usage in temporary as well as permanent construction. By exploring the physical structure of paper, as well as its properties and ways to improve these, we can manufacture building components that can be used for the construction of buildings made of paper and its derivatives. Since paper is widely available, affordable and environmentally friendly, it should be recognised as a building material of the future, for the right kinds of buildings with the right kinds of functions. Take, for instance, the cardboard constructions built by the homeless and refugees. Homeless people use whatever packaging materials they can get hold of in order to construct makeshift shelters in which they are able to survive successive nights in minimal thermal and atmospheric comfort. Paper products can be easily used to create cheap shelters for homeless and roofless people living in European cities, but they have also been used for homeless and roofless people in places such as Japan or Haiti, where thousands of people lost their homes as a result of natural disasters. Conflict zones like Syria or Ukraine need inexpensive residential structures that can serve as shelters for refugees, but refugees who have made their way to Europe could also be accommodated in individual cardboard shelters. Paper and its derivatives can also be used to build permanent lightweight shelters, suitable for transport by water, land or air, to be used in the most endangered and poorest parts of the world, such as certain countries in Africa, Asia and South America. In order to be able to determine the possible range of the use of paper, people seeking to work with paper must study its structure, basic physical and chemical properties and the ways in which these can be affected. The greatest threat to paper is humidity. Water causes the bonds between the fibre molecules to break, thus turning paper into pulp, which will lose the physical properties essential for load-bearing structures, such as strength and stiffness. Other potentially destructive threats to structures made of paper include fire, fungi and insects. The aforementioned threats can be removed by applying the right type of impregnation to building components made of paper. 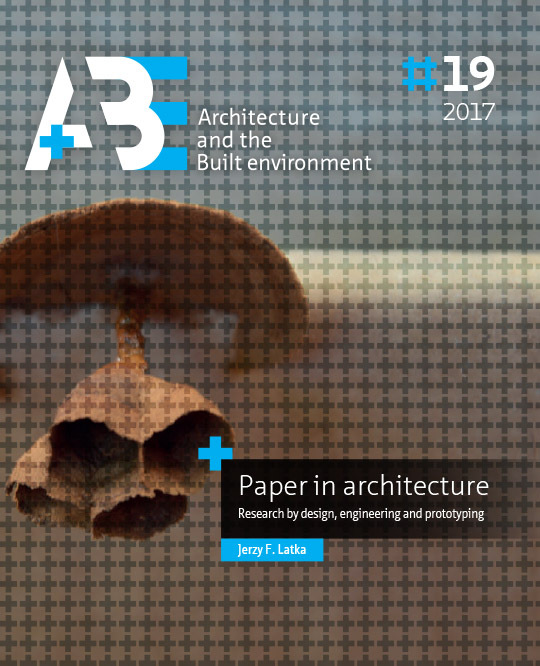 The belief that paper can successfully be used as an architectural material, which has been confirmed by successful projects realised all over the world, as well as the author’s personal experience with paper as an architectural material, was the main reason why the author of this dissertation took up the subject of testing the properties of paper to be used as a material for building components. Paper is a material we know from our day-to-day lives because it is used in newspapers, tissues, packaging, etc. Its web-like structure consists of wood fibres and can be visualised by comparing it to the cooking of a portion of spaghetti that is later served onto a plate. Paper is often associated with traditional materials and production technologies. Brought to life in the second century AD, paper has had a significant role in the history of civilisations, from the Chinese empire through the Guttenberg era up to the current ‘digital age’. It has primarily been used as an information carrier and packaging material. However, the architectural applications of paper have been known since the eighth century AD. Although production technologies and the finish of paper have changed and improved over the years, paper has in fact remained remarkably the same through the centuries. It still has the same composition: cellulose fibres bonded in a wet environment, then pressed and dried. Recently, not only the paper-making industry has undergone change, but other industries, like architecture, electronics, the automotive industry and others, are also receptive to the innovative qualities of paper. Growing awareness of the scarceness of fossil fuels and natural resources, the need to curb CO2 emissions and the necessity of reducing the ecological burden caused by the use of materials such as plastics, foam, concrete or steel is encouraging people to find more environmentally friendly solutions, including the circular economy. Paper and its derivatives can satisfy these needs, although it seems that the golden age of paper is coming to an end. Electronic devices such as smartphones, tablets and e-readers, as well as the growing popularity of electronic media, have taken the place of traditional print media, which has resulted in the paper industry’s decline as the producer of information carriers. However, the paper industry can develop in other directions, e.g. smart packaging, the provision of energy and construction materials, where this renewable and cheap material can make a new start, using and being used along with new technologies and innovations. Sustainable development was first described in the Agenda21 document in 1992 and its appendices, which state that the most important challenges for global policy are improving people’s lives and conserving our natural resources in a world that is growing in population, with ever-increasing demands for food, water, shelter, sanitation, energy, health services and economic security. Moreover, the European Parliament and the Council of the European Union ordered in Directive 2008/98/EC that by 2020, the weight amount of recycled or re-used construction waste must be increased to a minimum of 70%. These challenges can be addressed by renewable resources – reusable, recyclable, available and affordable materials, among other things. One of these renewable resources is paper. Paper base products such as corrugated cardboard, paper tubes, honeycomb panels and strong papers like Kraft and Washi can be successfully used for the production of interior design, products for everyday use, furniture, indoor partitions, pavilions and bigger architectural structures. Paper and its derivatives are often used for other purposes such as educational (origami) or social and artistic events. Moreover, paper and cardboard are cheap and eco-friendly materials. Therefore, are they fit to be used in spatial structures for a limited lifespan. Fairs, exhibitions, major sporting events and other short-term events cost an enormous amount of money, and in many cases leave behind an ecological burden in the form of construction waste. In 2008, under the EU’s revised Waste Framework Directive, a new target for recycling rates was established. By the year 2020 50% of municipal waste, including at least 50% of paper, metal, plastics and glass, will have to be recyclable, as well as 70% of demolition waste. The projects presented in this chapter are characterised by different size, geometry, materials and properties, as well as by different connections between these aspects. The projects were created by various designers, including the author of this thesis. In this chapter, the typology of paper and cardboard in design and architecture is described and depicted by means of realised examples. Smaller projects of the first two types are described below, in this chapter. For their part, more complicated structures, such as large pavilions, houses and public buildings, will be described in Chapter 4. Emergency and relief projects will be presented in Chapter 5. The examples of paper architecture presented in this chapter show the wide variety of materials and compositions used. The chosen examples are divided into two sections. The first section, entitled ‘The History of Paper in Architecture,’ embraces the projects realised from the late nineteenth century to the late 1980s. The examples provided in the ‘Case Studies’ section were assessed more thoroughly for their function, structural system, usable area, used material, connections and details of the structure (foundation, walls, roof), impregnation and lifespan. The chosen projects represent the most interesting solutions as far as structure and use of materials are concerned. Each of the examples described in this section presented an element of novelty in the world of paper architecture. The deteriorating situation of the inhabitants of many countries, especially in the Near East and Africa, has resulted in a growing number of people being forced to leave their homes. UNHCR has reported that the number of forcibly displaced people increased to 65.6 million in the year 2016 as a result of persecution, conflict, violence or human-rights violations. This was an increase of 6.1 million over the 2014 figure. It was also the highest number on record since the end of World War II. This number increased by 23.1 million in the five years since 2011. However, in addition to the forcibly displaced people, there are many people who lost their homes because of natural disasters, and those who have become homeless for a variety of other reasons. In the year 2015, 364 natural disasters (not including epidemics and insect infestations) were recorded by EM-DAT (the International Disaster Database), which resulted in 22,773 deaths and 98.6 million affected people. Another global problem is homelessness, i.e., a situation in which people or families cannot afford the kind of shelter that is considered adequate and meets the requirements for a minimal existence. This is a problem that occurs not only in poorer countries, but also in so-called developed countries. The OECD database on affordable housing states that 1,777,308 homeless people were reported in OECD countries in 2015. As it is very hard to define or recognise a homeless person, this number may be ‘off’ by quite a significant margin. Since 2015 there has been a large influx of people from the Near East and African countries in Europe. This influx has caused the largest migration crisis since World War II. By the end of 2016, Europe was hosting approximately 10.2 million of people of concern, including 6.6 million asylum seekers and refugees, 3 million internally displaced persons (including returnees) and more than 570,000 stateless people. There is a lot of debate on the subject of refugees and immigrants and on the policies in place to help them. However, the political discussion on this is beyond the scope of this work, so the author will not comment on it. The focus of this part of the thesis is on potential architectural solutions for people who find themselves in a difficult housing situation, for whatever reason. In this thesis, emergency and relief architecture is understood to refer to structures, buildings and infrastructure that support people in need, such as forcibly displaced people, victims of natural disasters or homeless people. Each of the aforementioned groups requires a different approach with regard to safety, policy and medical or psychological support. Each group is also characterised by different factors. In order to understand the differences, so as to be able to provide the right type of support, it is important that we gain an insight into the characteristics of each group. Both emergency shelters and temporary houses can be made out of paper components. Depending on the situation, they can be either temporary or semi-permanent shelters or buildings. This part of the dissertation is dedicated to the practical approach to cardboard as a building material through prototyping. Taking a practical approach here means conducting research by design and prototyping architectural structures in which paper and its derivatives are used as the main structural material. The theoretical research and knowledge presented in the previous chapters of the dissertation will be now used as input. The research by design and the realised prototypes will guide us to the solution that answers the question to what extent cardboard can be used as a suitable building material for emergency architecture. The research and development of cardboard architecture used as input for this dissertation were derived from research previously conducted at TU Delft’s Faculty of Architecture. The Cardboard in Architecture research group, which was set up in the department of Building Technology in 2003 and ceased to exist in 2008 due to the great fire that destroyed the building of TU Delft’s Faculty of Architecture (13 May 2008), made a great contribution to this research. The fundamental and technical research was included in the previous chapters. The designs and development of products in the form of prototypes of cardboard structures are presented in this chapter. TECH: Transportable Emergency Cardboard House was a project involving shelters for people in difficult housing situations. The TECH project was based on previously conducted research. The fundamental research on paper, presented in Chapter 2, focused on the material itself, its mechanical properties, its chemical and physical structure, its production methods and elements mass-produced by the paper industry. Next, research was conducted on the applications of paper products in design and architecture. The sixteen realised structures, in which paper was employed as a building material, were analysed for their structural systems, the paper products used, the connections made between the structural elements, the connections with the ground, the impregnation methods deployed and the design and implementation processes involved. Lastly, the paper emergency structures realised in the form of prototypes, in which different paper products and structural systems were examined, resulted in the further guidelines for paper emergency shelters presented in Chapter 6. A column-and-beam structural system was chosen as it is a simple system that can be built quickly without professional construction workers and without special equipment and tools. The chosen structural system consists of slender elements in the form of columns and beams. To build that system cardboard U- and L-shapes were used. Paper tubes, which were an alternative for the U- and L-shapes, are hard products to connect to other types of building components due to their geometry. Either the paper tubes are placed inside a building, taking up space that may already be limited, or they are incorporated into the envelope, where they are subject to external conditions. For this reason, it is more practical to use paper products such as L- and U-shapes as structural elements. The TECH project was targeted at forcibly displaced and homeless people. Please refer to Chapter 5 to read more research on motivations and guidelines for emergency and relief shelters. The number of homeless people living rough or in shelters or hostels provided by aid organisations in developed countries was 1,777,308 in 2015. Asylum seekers who come to Europe but are not granted refugee status run the risk of becoming homeless. Each of the aforementioned groups requires different types of support, including housing. As far as accommodation is concerned, the support they receive may come in the form of mass shelters, dispersed settlements, hosting families or spontaneous or planned camps. TECH is an acronym for Transportable Emergency Cardboard House. The designations ‘TECH 01’, ‘TECH 02’ and ‘TECH 03’) refer to successive versions of the project where structural parts and building components and impregnation techniques were improved. There are three generations of TECH. While TECH 01 was prepared as an unbuilt project and only the prototype of the wall structure was executed, TECH 02 and TECH 03 were executed as 1:1 scale prototypes. TECH 02 was exhibited at the campus of TU Delft’s Faculty of Architecture for several days. TECH 03 was built in September 2016. Since then it has been at Wroclaw University of Science and Technology’s Faculty of Architecture, where it is exposed to natural conditions and changing weather conditions. In general it can be said that TECH is a group of solutions for emergency and temporary housing, which can be used to serve people in difficult housing situations. However, TECH 03, also known as ‘the House of Cards’, may also serve as a commercial structure. It can be used as a garden or summer house, as an extension of existing buildings, shed, temporary office building, hotel room or storage space for events like trade fairs, exhibitions, major sporting events, etc. TECH 03 was designed to meet European architectural standards, especially with regard to thermal insulation. This chapter is mainly concerned with the structural system of the TECH solutions, as well as the paper products used as building components, the usability and feasibility of the shelters and their production methods. Cardboard is generally regarded as an eco-friendly or ‘green’ material. The sustainability of cardboard as a building material can be researched from different points of view, and different aspects should be taken into account. To answer the question as to whether cardboard is a ‘green’ or sustainable material for building applications, we must first define the meaning of these words. Next we need to research the various types of impact cardboard used as a building material may have on the environment. The word ‘green’, in relation to buildings, is open to many interpretations. In many cases the word ‘green’ is used for marketing purposes. Cardboard products, in particular, can easily be called green because of their eco-friendly appearance. Take, for example, furniture made out of cardboard, which is often described as sustainable. Generally speaking, this type of furniture is very expensive, which means that only wealthy people will be able to afford it, which is in contradiction with one of the main tenets of sustainable development. The phrase ‘sustainable development’ has a much broader interpretation. The author of this dissertation adheres to the narrower definition. Sustainable development in general means that current development meets the present needs without compromising the ability of future generations to meet their own needs. Sustainable development has two highlighted concepts: the concept of the essential needs of the world’s poor, which should be fulfilled as a matter of priority, and the idea of limitations imposed by the state of technology and social organisations on the environment’s ability to meet present and future needs. Sustainable construction improves the life cycle of building by lengthening the lifespan of building components, increasing the flexibility of the functional and spatial layout of buildings and their potential changes, and promoting the recycling of materials and products after a building has been demolished. The life cycle of a building consists of four stages: pre-construction (Stage I); construction (Stage II); post-construction (stage III) and demolition (stage IV). It follows that the entire cycle of materials consists of the following stages: production, construction, usage, demolition, recycling, reusing processes or final disposal. The total life-cycle energy use of building includes both operating energy and embodied energy. Operating energy includes the energy used to maintain the inside environment through processes like heating, cooling, lighting and operating appliances. With regard to operating energy, materials can be rendered more sustainable by ensuring they have a higher thermal insulation value or greater thermal mass. But the most important factor with regard to operating energy is that the project take into account the local natural conditions and adapt to them. Higher sustainability can be achieved by reducing the use of raw materials and reducing the loss of resources during the production and construction processes and throughout the life of the building. It can be also improved by recycling of the used materials, in such a way that recycled materials can be used again at their original level of quality. Life Cycle Assessment is a method used to measure and evaluate the environmental impact of product systems or activities by describing and assessing the energy and materials used and released into the environment over the course of a building’s life cycle, from cradle to grave. The assessment of the environmental performance of cardboard as a building material is based on the following environmental categories proposed by M. Vaccari in her dissertation. Global warming, climate change and emissions to soil, air and water. This study has demonstrated how paper and its derivatives can be used as a building material and main structural material in design and architecture. The usage of paper in architecture is limited by many factors, including its vulnerability to moisture, humidity and water, creep and the limited variety of products created by the paper industry. However, paper and paper products can be successfully used in several types of architecture and design. The advantages of using paper in architecture are its low price, the fact that it is mass-produced, its ease of recycling and the mechanical properties of the material. The paper industry’s current focus seems to be on packaging materials and new functionalities of paper and cellulose-based materials. Paper will never replace traditional building materials, but it can fulfil a niche demand created by certain designers and architects. It can be used for products such as interior and industrial design, including everyday objects, partition wall systems, furniture, exhibition pavilions, stage sets, venues for temporary events such as trade fairs or major sporting events, medium-lifespan housing (with a lifespan of up to twenty years) for the private and public sectors, public buildings emergency shelters. This Chapter 8 presents the conclusions of this thesis. First, the research questions and sub-questions are discussed. The research questions are answered in the relevant chapters of the thesis. Chapter 2 presents the some fundamental research on paper, including its history, production, mechanical properties and products produced by the paper industry. Chapters 3 and 4 present the scope of paper usage in design and architecture. Chapter 3 presents the types of paper designs in architecture, while Chapter 4 outlines developments in paper architecture on the basis of sixteen realised structures. The buildings are described in detail, with a particular focus on structural engineering and the paper products used in the various projects. Chapters 3, 4, 5 and 6 follow a research-by-design approach which includes engineering and prototyping. These chapters present prototypes of paper furniture, pavilions, domes and shelters, made of paper products such as corrugated cardboard, honeycomb panels, paper tubes and U- and L-shaped cardboard profiles. The prototypes in question were built by the author of this thesis and his students and partners. They demonstrate different approaches to the potential use of paper in architecture. Chapter 7 presents the project of the Transportable Emergency Cardboard House. TECH is the final project encompassing the author’s fundamental, material and design research and previous prototypes. There are three generations of TECH, each of which is subsequently improved with regard to its design, structural system and method of impregnation. Chapter 1 outlined two primary research questions, as well as seven secondary research questions. The answers to these questions can be found in the present chapter.